I mentioned in another post that I recently bought The Pastry Queen Christmas. I seriously cannot say enough good things about it. It is chock full of delicious treats and indulgences. I've made no less than 5 recipes out of it in the month that I've had it. 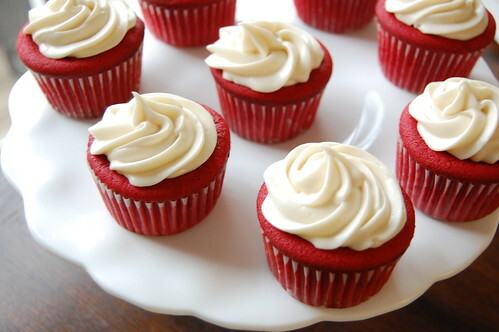 These red velvet cupcakes met my already exceedingly high expectations I have of her recipes. They are moist and sweet, without being cloyingly so. The vinegar and sour cream gave them a nice tang, and the chocolate richened the flavor. I didn't use her suggested marscapone cream cheese icing; rather, I used a pretty standard one from Annie's Eats. It was so smooth, and piped so beautifully. I have already made these cupcakes several times, and its not looking to slow down anytime soon! Preheat the oven to 350. Line 2 cupcake pans with liners and spray with cooking spray. In a small bowl, combine the cocoa powder and food coloring with a fork, mashing and mixing until it forms a paste. Set aside. In the bowl of a stand mixer fitted with a paddle attachment, cream the butter and sugar at medium-high speed until it is light and fluffy, about 2 minutes. One at a time, add the eggs, stopping to scrape down the bowl as needed, and allowing each one to be fully incorporated. Reduce the speed to low, and add the cocoa paste. Increase to medium speed and beat the batter for about 4 minutes. Meanwhile, sift together the cake flour, all-purpose flour, salt, and baking soda. Stir the vanilla into the buttermilk (this can be done in a measuring cup). Add the flour and buttermilk in increments, alternating between each addition. Start and end with the dry ingredients. Beat on medium speed until just combined. Add the vinegar and sour cream and beat at low speed until just combined. Divide batter evenly among the muffin tins, filling each one about 3/4 full. Bake 17-22 minutes, only until the cupcakes feel firm to the touch and a toothpick inserted into the center comes out clean. Be careful not to overbake, as the cupcakes will dry out easily. Remove from oven and allow to cool in pans for 5 minutes. Remove the cupcakes from pan and allow to cool completely before frosting. Cream the butter and cream cheese in the bowl of a stand mixer fitted with the paddle attachment, until creamy and smooth, 2-3 minutes. Add the vanilla extract. Gradually add the confectioners sugar over low speed, and when well combined, increase to medium. Beat until smooth. They look perfect! I'm hoping to make red velvet cupcakes again very soon. I'll have to convince a coworker with a Feb. birthday that this is their choice :) Glad you liked the frosting! It's always my go-to cream cheese frosting. Tastes awesome and looks pretty. 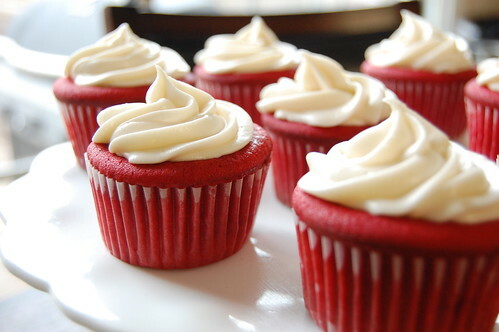 I really love red velvet... and the frosting is the best... have a nice weekend! What exactly do you for the coloring?? ?